I had explained the concept of Spin, handedness, fermions, pauli exclusion principle, force mediators etc using the Conch and Wheel in the earlier few posts. The excitations of the scalar, vector and spinor fields can have 'handedness' (chirality). It means they are either right-handed or left-handed. Depending on their intrinsic angular momentum this handedness is seen as 'helicity' (clockwise movement or anti-clockwise movement). Vaikuntha is the weak-force vector field in which Vishnu (the property of mass) resides. Yama is Electric Charge, kAla is weak Charge and Vaishravana is Color Charge. There is no anti-neutrino race as like others. We already saw that particles that rise out of this spinor field, conch, have 'handedness' called Chirality. All particles possess intrinsic angular momentum and motion due to which this handedness or chirality is perceived as 'helicity'. Thus particles can be classified as 'right-handed' or 'left-handed'. I had explained it in previous chapters. It means there could be two electrons (a type of charged lepton), right-handed electron or left-handed electron. There could be two anti-electrons (called positrons). Right-handed positrons or Left-handed positrons. So what happens to this handedness.? Where are in they in these five races..? The Conch of Vishnu is not just a spinor field and more precisely called 'dirac-spinor' field as these are fields with 'mass' terms, as Vishnu (the property of mass) holds them. This spinor field interacts with Higgs field and acquires mass. Due to 'mass' caused by Higgs field, the five races get their handedness 'mixed. This means every particle becomes a mix of its right-handedness version and left-handedness version. For eg., an electron becomes a mix of Right-handed electron and left-handed electron. Shiva, the Energy is also depicted as holding Conch. They are spinor fields with no mass terms. Such spinor fields are called 'Weyl' spinor fields. Particles that arise from these spinor field have their handedness separate and distinct. But the 'Conch' of shiva does not lead to any particles as we know it, as it is massless. Only 'mass' causes the birth of particles. But it is also the 'mass' that causes the decay of particles. How..? Yes, they don't possess kAla the weak charge. Hence they don’t interact with Weak force. Thus they don’t decay and remain young always. 'kAla’ which is the weak charge and also ‘arrow of time’ (we will see how later) does not elapse for them. They remain eternally young. They are the four ‘kumara’ called Catur-Sana, which means the four that remain the same from the beginning. (They never grow/decay). Except these four kumaras, all other particles are subject to weak force and decay in course of time. 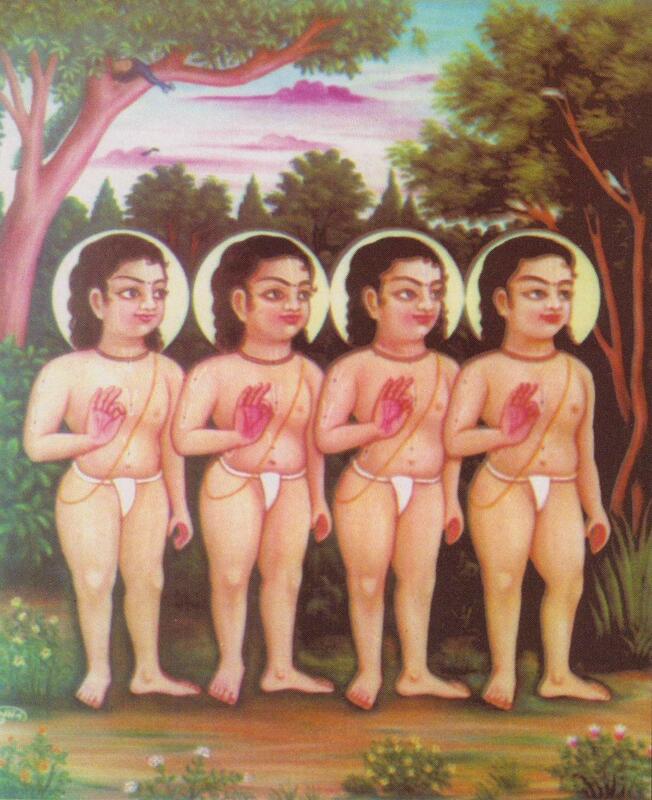 Since all these four are excitations of the same field and they don’t decay by weak force, they are pictured as four kumaras that are always together. 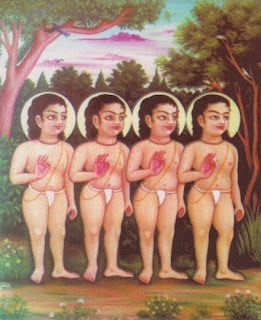 These four Kumaras exist in the Universe independently and moving around before mass manifests and mixes them up. They are excitations of weyl spinors. They are the one's that Brahma is said to have created, but who did not want to evolve/grow and remained 'ascetics' for ever. But the property of mass acquired by Spinor fields mix up the Right-handed and left-handed particles. Thus every particle has a component that has kAla the weak-charge and another that does not have weak-charge. Thus, the property of mass, Vishnu, causes all massive particles to acquire 'kAla', the weak-charge. Thus all massive particles can decay due to weak charge as they have some left-handed component. That's how Vishnu who causes the birth of all particles also seeds in the 'death' of all particles. A particle and anti-particle are differentiated by Yama (Electric Charge) and kAla (Weak Charge). For eg., an anti-particle of Left-handed electron is Right-handed positron. They differ in their Charge (Yama- Yami) and handedness primarily. But handedness maps to weak charge, kAla. Hence particle and anti-particle are differentiated by Yama and kAla. But any massive particle has its handedness mixed, because higgs field interaction mixes up the handedness. Hence for any particle with mass, it is primarily the Charge, the Yama, that is the differentiator. But then there is also a particle with neutral charge. They are the neutrinos. For neutrinos with neutral Charge, which do not have yama, the electric charge, the anti-particle definition becomes tricky. The handedness and lepton number conservation laws could be still used. Based on kAla, the weak Charge, left-handed neutrinos are called 'neutrinos' and right-handed neutrinos are called 'anti-neutrinos' as they both interact with weak charge. But we never find any right-handed neutrino or whatever right-handed neutrinos found are termed right-handed anti-neutrinos and whatever left-handed are termed neutrinos. Though it is not proved yet, right-handed anti-neutrinos are the right-handed neutrinos too, as neutrinos are anti-particle of themselves. That's why there is no race of 'anti-neutrinos' like the race of anti-quarks or anti-leptons. Hence the 'massive' races that emanate from Conch of Vishnu, the Dirac-Spinor field are only five.